Note: This interview first ran as part of our coverage of the 2014 Hamptons International Film Festival. 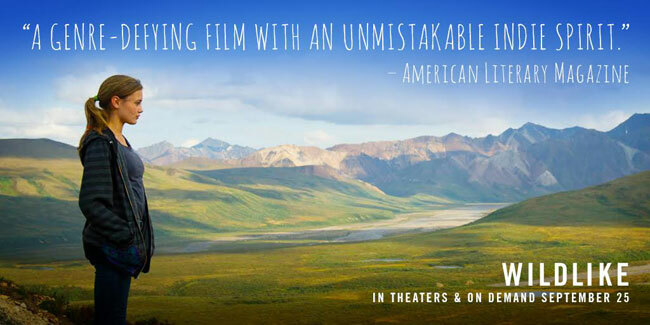 Wildlike opens in select theaters and on iTunes on Friday, September 25. Watch the trailer and follow Wildlike on Facebook, Twitter and Instagram. A beautiful trek into the stunning Alaskan wilderness, Frank Hall Green’s Wildlike follows 15-year-old Mackenzie on her first visit to the last frontier. When her stay with ‘Uncle’ takes a traumatic turn, Mackenzie must embark on a dangerous journey through the wilds alone. On her way she encounters another lone traveler (Bruce Greenwood, Thirteen Days) and together they offer one another something that cannot be found on any map: a chance at salvation. Starring Ella Purnell (Maleficent), Ann Dowd (True Detective) and Brian Geraghty (The Hurt Locker), Wildlike is a thrilling and taut emotional journey. Congratulations on your world premiere! How do you describe Wildlike in your own words? Frank Hall Green: Well, there is a description of the story, and then there is what the film is really about. The summary is that Wildlike is the story of a young teenage girl Mackenzie who is sent to live with her Uncle in Juneau while her mother is in rehab in their hometown of Seattle. When the relationship with her Uncle turns, she runs away and begins to follow an older, recently widowed backpacker who is also from Seattle. Gradually he becomes complicit in her journey; they help to heal each other and he returns her to Seattle. But what is the movie about? For me, Wildlike is about pain, escape, adventure and recovery. All the characters experience pain, deserved or not, and seek to escape in one way or another. Alaska, as a location and character, is a place that allows freedom, beauty and a setting for the beginnings of recovery and re-stabilization for Mackenzie. It is a frontier, like that of one’s innocence. In the end, the movie is more about finding healing than running from pain. As the writer/director, what inspired you to tell this particular story? 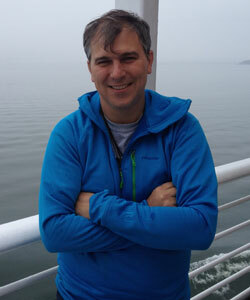 Frank Hall Green: The origin of Wildlike came from several aspects of my life and interests. As a backpacker and lover of the outdoors and adventure, Alaska was an easy choice for a backdrop. As a storyteller, I have always turned to and been attracted to journeys and tales of adventure, especially directionless journeys. As a child I daydreamed of a journey, running away; however, not from anything, but for excitement. As an adult, virtually all my nighttime dreams are aimless adventures. As a human being, and one who has experienced pain and healing in my life, I wanted to speak to the human condition as a dichotomy of damage and healing, trauma and recovery, and the reality that this is a lifelong experience. On the social issues in the film, they have become important to me over time, and I became dedicated to presenting certain issues in a truthful, effective way. I married the idea of adventure and healing with the social issues of the film, which in turn would be the cause of Mackenzie running, allowing me to explore deeper characters and present issues important to me in the film. 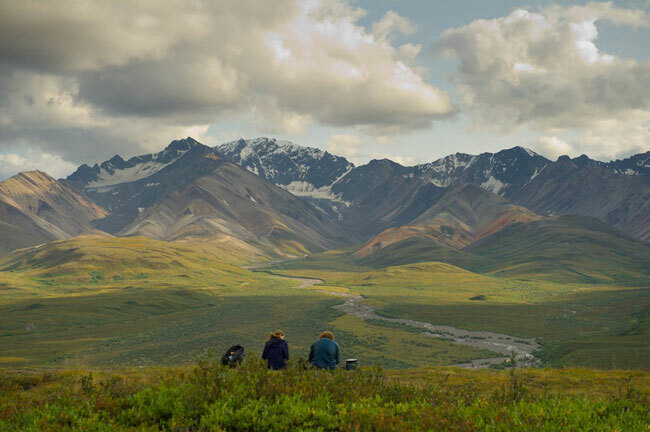 The Denali National Park is very much a central character in your film. How important was it to incorporate the landscapes into the story and into the emotional journey your characters take? Frank Hall Green: Extremely important. I would not have made a first feature without outdoor landscapes, and magnificently grand ones at that. Nature has healing power for me, and the great outdoors provides a reflection on life and living that allows issues to be seen more clearly and simply. It grants us perspective; not ironically, we are put into perspective when we reach a great promontory, the top of a mountain or the middle of a expansive valley. It’s quite obvious in the film that the characters recover in the wilderness and are allowed (if not forced) to form relations and heal with each other because of the journey into Denali, and all over Alaska. You have a terrific cast, including the always-riveting Bruce Greenwood, and Ella Purnell, whom audiences may recognize from Maleficent and Never Let Me Go. What can you share about your casting process? How did you work together to create your characters and survive Denali? Frank Hall Green: After a day of meeting with agencies and actresses for the role of Mackenzie in Los Angeles, I turned on the television and watched the movie Never Let Me Go, just to unwind. Ella Purnell came on screen and I said, “That’s her.” In fact, I said, she’s too freaking beautiful, but I know that is Mackenzie. Within 10 minutes I was texting with the agent at UTA with whom I had met earlier that day. Ella did a video audition, we Skyped, and then we met in London. I knew Ella was talented, but we got serious about the character’s darkness in the final weeks prior to the shoot. I stressed the interior, unsaid parts of the character, and gave her lots of reading material on the issues. Ella landed in Alaska only speaking American English for 6 weeks, and on Day 1 she brought the character to life beyond expectations. She had really studied and listened and felt the intensity I spoke of regarding the character’s difficulties. She is also a wonderfully sweet person, smart, talented in many ways and on a very good path. The whole crew loved her. With Bruce Greenwood, I discovered what many people already know—he’s a talented, experienced, super-charged, smart presence and actor. Bruce had the look and also had his origin in the Atom Egoyan films, which I felt was perfect. We had a long conversation and immediately jumped into the story and character—Bart’s every thought, turn and twitch. When Bruce landed in Alaska, we spent two days reading the script and asking ourselves, “What is the natural response, decision and step for the character here? What feels true?” We both knew we wanted to sell this story in a very natural way, and Bruce watched a short of mine that I believe gave him the understanding that together we could pull this off. I really commend him on bringing 110% and finding a very good balance of working with a first feature director. He’s a good friend, and also a hilarious comedian. We were entertained for 6 weeks! As a first-time feature film director, do you have one piece of advice for aspiring filmmakers? Frank Hall Green: A single piece of advice? Practice makes perfect, in that you must study and review your own efforts and mistakes and find where you went right or wrong and how your films are perceived. Not because “it matters whatever everyone thinks”—it doesn’t—but because filmmaking is a lifelong study, and to study, one must be critiqued, reviewed, graded and corrected. And it is most difficult to review oneself. Frank Hall Green: Two things: enjoyment of the film, and perhaps a strengthening of the idea that positive human relationships and healing are the core of survival, and the greatest success in life. What are you most looking forward to at HIFF 2014? Finally showing Wildlike in front of an audience, and beginning our journey to finding further audiences. After its World Premiere at HIFF 2014, Wildlike opens in select theaters and on iTunes on Friday, September 25, 2015. Watch the trailer and follow Wildlike on Facebook, Twitter and Instagram. Producer, writer and director Frank Hall Green’s directorial-debut feature, Wildlike, was filmed in Alaska. Produced by Tandem Pictures and Christine Vachon, it stars Ella Purnell, Bruce Greenwood, Brian Geraghty, and Ann Dowd. He’s currently producing the adaptation of Boy21 by Matthew Quick, to be directed by Lasse Hallstrom; and Remittance, written/directed by Joel Fendelman and Patrick Daly. Recently, he produced Ghetto Klown, Allegiance and 1-900-Tonight. Frank has an MBA from NYU’s film school. Before NYU, Frank worked in Venture Capital. He’s an alumnus of NYU’s Gallatin School, an avid backpacker and member of Mensa. Hey Frank, Nancy sent me your interview. Great job – know the movie will be just as good.